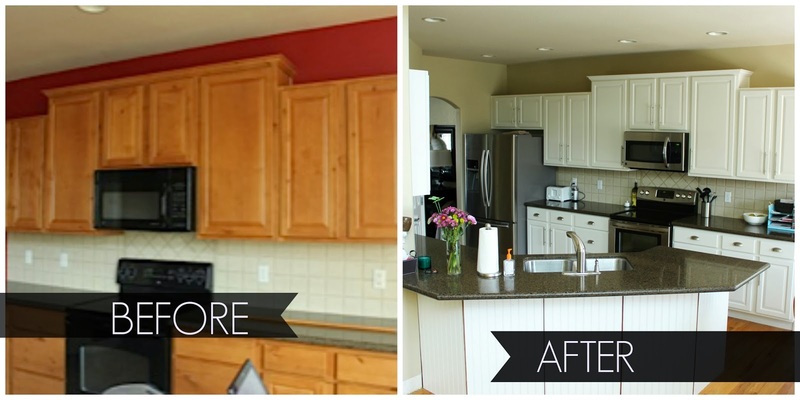 Have you ever wanted to update the look of your kitchen or bathroom? 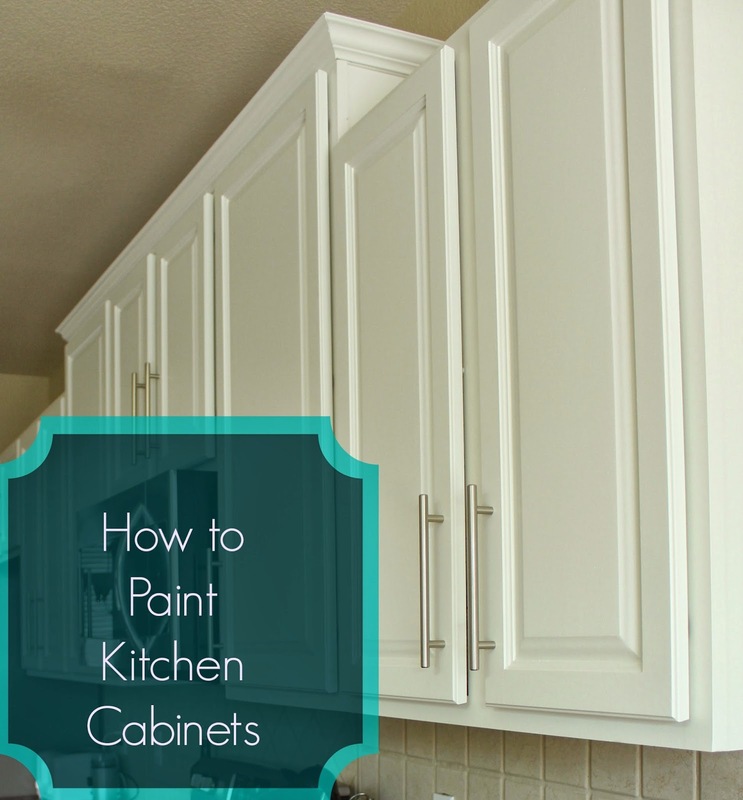 I have found the easiest way to make the largest impact is to paint the cabinets. Over the years, I have painted 3 sets of bathroom cabinets and 3 sets of kitchen cabinets and I have learned something new every time. 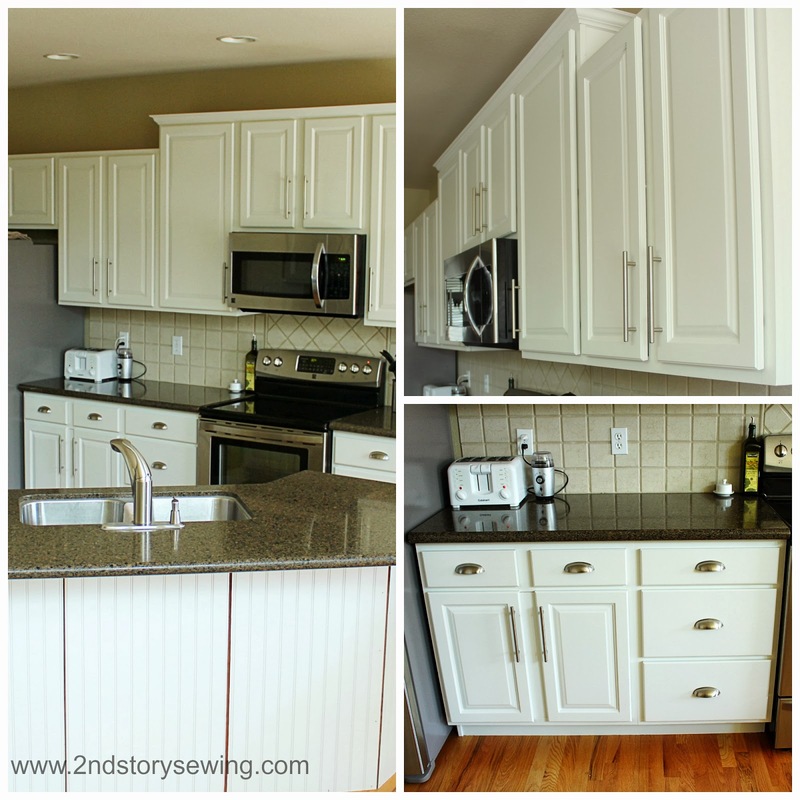 I wanted to share today the steps I used to help achieve a beautiful paint finish on my latest kitchen cabinet project. But before I get to the steps, here are some before and afters to help you see the impact new paint can give a room. (I apologize for the grainy before photos, my computer deleted my original copies). When we purchased our house it was full of strong, dark colors. While I actually used to have a red bedroom in a former house, over the years I have become a big fan of neutrals. They are much easier to decorate with if you like to change up your accent colors, styles, accessories, etc. So, the whole first floor was given a fresh coat of tan paint when we purchased it. The color is Cliveden Sandstone, which is a Valspar paint I had mixed by Sherwin Williams. I LOVE this paint color. It has been in my last two houses, my parent's house, and my in law's house. It always looks good. The Super Paint from Sherwin Williams covers so well too, this room was not primed and it covered the red easily. The only thing I don't love this paint next to, is the tile in this house...but that may be changing anyway. So, here is what I found worked the best in this makeover. First and foremost, if you can find help, take it. My sister in law was living with us at the time and helped from start to finish. 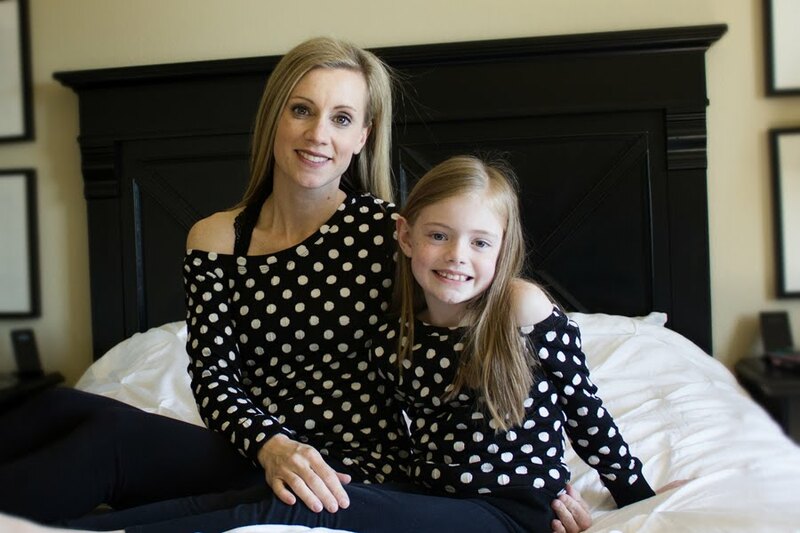 The two of us worked for one week on this project, minus time out to help my kids, run to events, etc. It will take A LOT of time and you will need PERSEVERANCE. 1. Remove the doors and drawer fronts. We did this in sections because I did not have room to paint all the cabinets at once. The good news is, we didn't have to paint the interiors of the cabinets, so we were able to leave everything inside. 2. 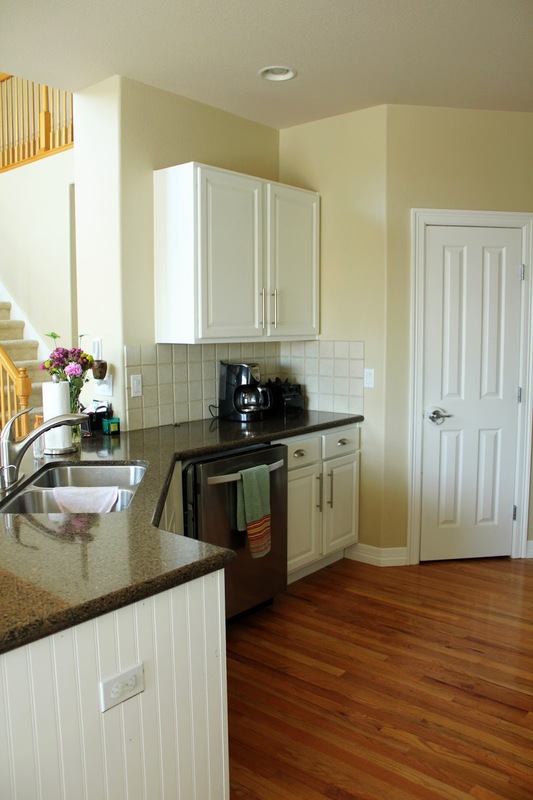 Clean your kitchen cabinets well and then wipe down all the surfaces with a liquid deglosser or sand them. We chose the liquid deglosser for less work, less time, and way less mess. It worked so well and is the way I will always do cabinets in the future. I originally decided on this technique after watching the pros on This Old House suggest it. 3. Fill any holes and imperfections with wood filler and sand. These were knotty wood cabinets and there were TONS of holes. In addition, these cabinets were beat up on the inside. Lots of deep scratches from the pull outs and such. This step took a lot of time, but made a huge difference. Make sure your wood filler is fully dried and sanded smooth before continuing. 4. Prime the cabinets and base. I use the same primer on all my projects and have loved it every time. Zinsser Cover Stain. It is oil based, so it will stink and I hate the cleanup, but it is worth it. We used foam disposable brushes, rollers and disposable dip trays, so it wasn't horrible. Put on THIN coat of primer and do your best to avoid brush strokes. This is key to a smooth final finish. If you get any drips or brush marks, make sure you sand them down. I used a "in between coats" sand paper after the primer to knock down any marks. 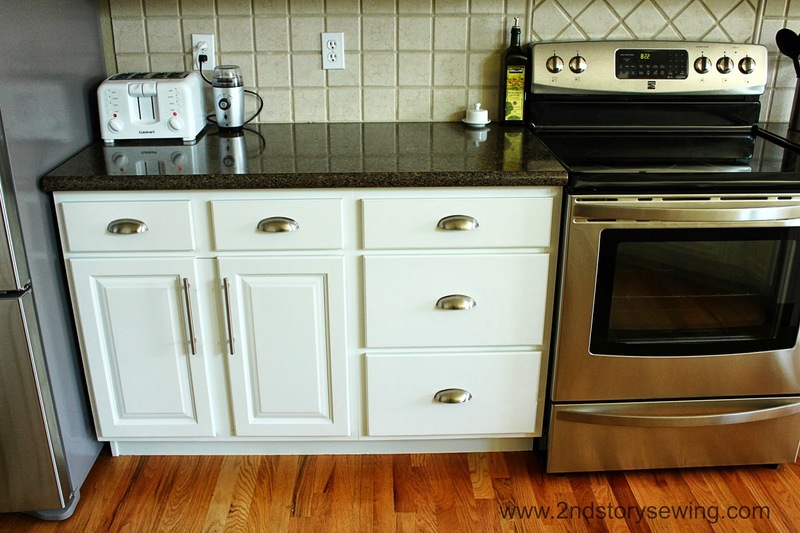 Then thoroughly vacuum and wipe down the cabinets after you sand. 5. It's PAINT time. The quality and type of paint you chose will make a huge difference. I prefer Sherwin Williams over all other paints because I have had the most success with it. Plus, they are always so helpful when making paint decisions. I chose the Pro Classic Interior Latex in Alabaster White. It helps to achieve the brush free look you are after and it covers well. I spoke to them about whether or not I needed a final coat of varnish or poly for protection and they said no, not with this paint. I took their advice, and the paint is holding up great. **Buy brushes and rollers made for the job. I prefer a Purdy angled brush to cut in and a small roller made for cabinet painting. Some people are able to achieve the brush free look with brushes only, but I am not one of them. I have tried, without success, so I use the easier method of a roller and have been very pleased. Use thin coats and put it on slowly to avoid bubbles. Sand in between coats and cover it well. 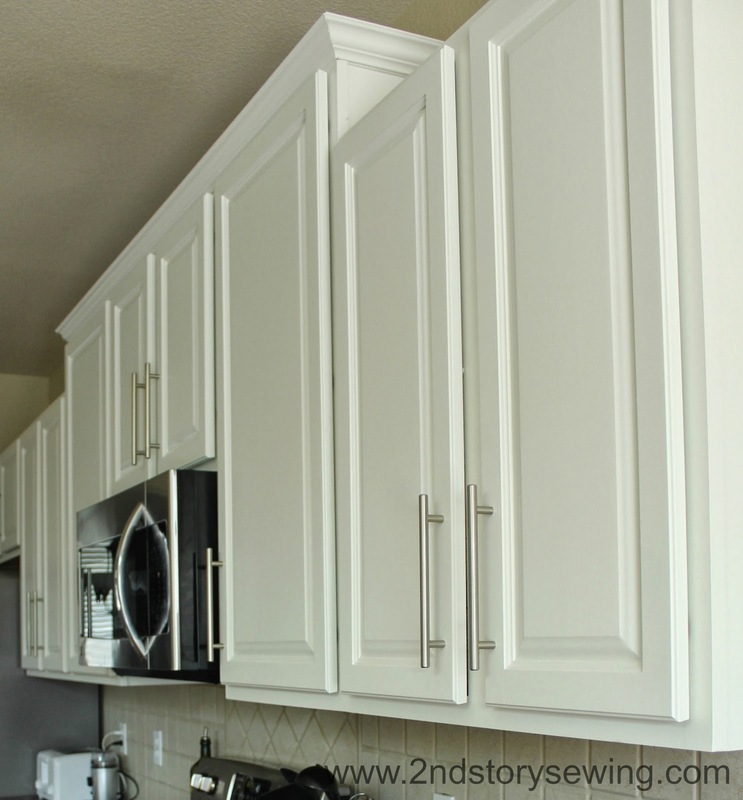 I used three thin coats of paint on my cabinets and feel the coverage was perfect. **Keep your paint supplies ready to go with plastic wrap. You can wrap your brushes and rollers tightly with plastic wrap in between painting to keep them from drying out as well as push it down into the paint in the paint tray. The paint tray will get a tad gloppy with drying so put a layer of plastic down over the bumpy part when you start painting again to avoid big clumps in your paint. 6. After three thin coats of paint (sanding and wiping/vacumming well in between coats), let your paint dry as long as you can. (The longer it cures, the better it will hold up). But, if your impatient like me, you can put them back up in a day or two. 7. Chose hardware and hang. My husband did the hanging to make sure all the hardware was level. This is his domain and he is very good at it, so I stay far away :) The hardware I was provided is from D. Lawless Hardware. I would highly recommend this company. They have wonderful prices and they ship it quickly. I chose the Stainless Steel Bar and a Satin Nickel Cup Pull. Their staff also helped me make my selections. You can see how I used some of their other hardware on my dining buffet makeover HERE. We are currently in the process of trimming out the island with bead board so ignore the gaps :) That project will be coming to the blog soon. I also am trying to decide on a backsplash. I originally wanted bead board but now wonder if it will be too much white...what do you think? Do I leave it tiled or change it to something else? Hopefully in time I will able to bring in some more projects in here and bring a little life to this kitchen, but in the meantime we are enjoying our new crisp white cabinets. Looks great! 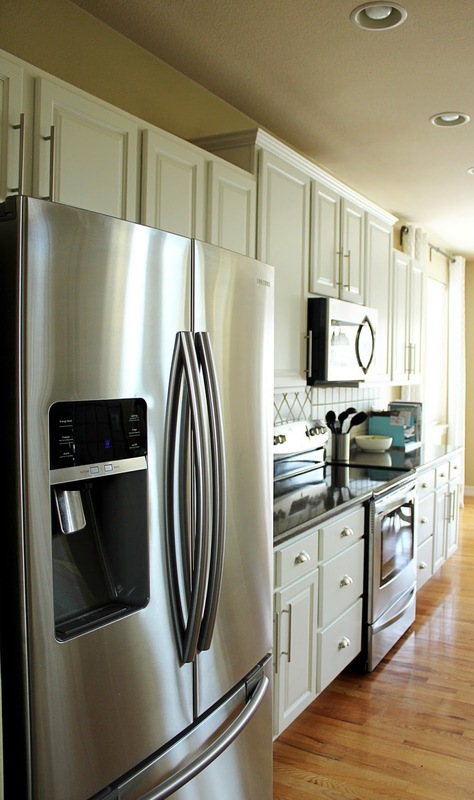 I love the look of stainless steel on white cabinets! The cabinets look awesome!! I would just leave the tile. 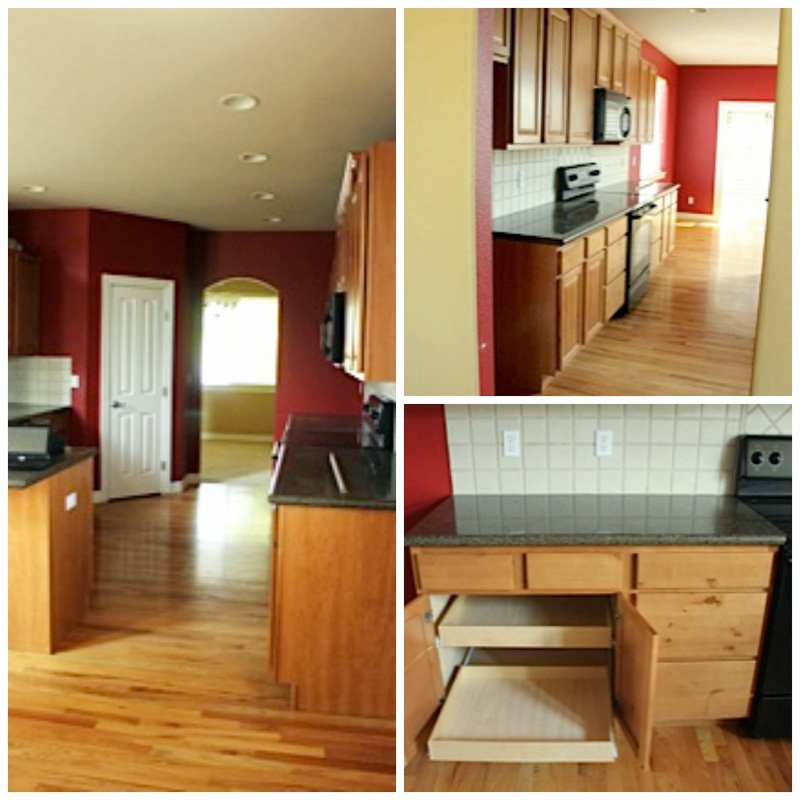 It looks great :) Your kitchen looks so roomy and nice. The white cabinets makes it look so much bigger. Lots of great advice here that I will be needing this year as we are now purchasing our first home - thank you for sharing all your tips!! It looks fantastic! WOW this is gorgeous! Sharing on FB a little later today! Thanks for the great tips! I agree, the beadboard backslash might be too matchy, matchy. I'd go for a different texture. Are you going to paint the island with a pop of color?